An inside-out version of Straight Bar Lacing, which distributes pressure evenly plus keeps the knots & ends to the side. For hiking / bushwalking, position the knots on the inside, away from snagging undergrowth. For biking / cycling, position them on the outside, away from chains & cranks. • Begin straight across on the inside (grey section) and out through the bottom eyelets. • The left (blue) end runs straight up on the outside, then straight across on the inside. • Both ends run straight up on the outside, each skipping one eyelet and feeding in two eyelets higher up. • Both ends continue straight across on the inside and out through the adjacent eyelets. • Alternate running up on the outside and across on the inside until the ends emerge through the top and second-from-top eyelets on the same side. • The left (blue) end runs straight up on the outside and in through the next higher eyelet. • The right (yellow) end runs straight up on the outside, skipping one eyelet and feeding in two eyelets higher up. • The left (blue) end runs straight across on the inside, then straight back on the outside before tucking under the previous vertical shoelace segment (similar to the tucked segments of Ladder Lacing). • The left (blue) end then continues straight up on the outside, skipping one eyelet and feeding in two eyelets higher up. • The right (yellow) end runs straight across on the inside, then straight up on the outside, skipping one eyelet and feeding in two eyelets higher up. • Both ends run straight across on the inside and out through the adjacent eyelets. • Both ends continue straight up on the outside, each skipping one eyelet and feeding in two eyelets higher up. • Alternate running across on the inside and up on the outside until the ends emerge through the top and second-from-top eyelets on the same side. No gaps under the horizontals makes them less likely to get caught when crawling through scrub. 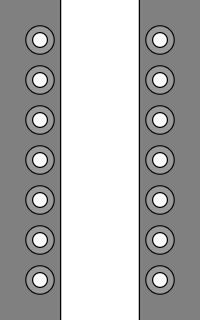 In addition, tying the knot at either top-left or top-right then gives this lacing two different and distinct applications (see below). Hiking / Biking Lacing only works neatly on shoes with even numbers of eyelet pairs (eg. 8 pairs = 16 eyelets). This is because the shoelace must cross the shoe an even number of times so that the ends will meet and can be tied together. On shoes with an odd number of eyelet pairs (eg. 7 pairs = 14 eyelets), a workaround is needed so that the ends still meet. The "across and back" workaround (shown above) is probably the best compromise in terms of retaining the overall look plus allowing a regular knot. See below for several other odd workarounds. Lace one shoe as above and the other shoe in reverse, with both knots positioned towards the inside (between the ankles). This places the loops and loose ends further away from the outer sides of the shoes, making them less likely to become snagged in undergrowth while hiking / bushwalking. Lace one shoe as above and the other shoe in reverse, with both knots positioned towards the outside. This places the loops and loose ends further away from the bicycle chain, cranks and other moving parts. Grey Nike Norths with Hiking / Biking Lacing. 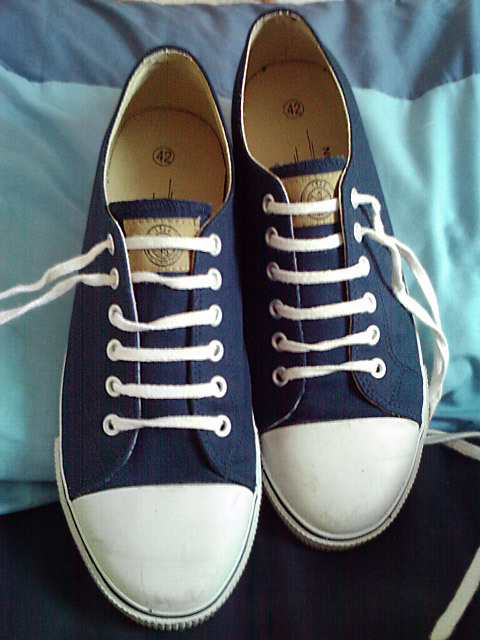 Longer ends if existing shoelaces are re-used (+28% on average). As mentioned above, Hiking / Biking Lacing only works neatly on shoes with even numbers of eyelet pairs. Here's several common workarounds for shoes with odd numbers of eyelet pairs, using sample diagrams with seven pairs of eyelets. This first diagram shows how the ends don't meet naturally, instead ending up diagonally opposite each other. This defeats the whole concept of this lacing, in which the ends are intended to be tied at the side of the shoe. 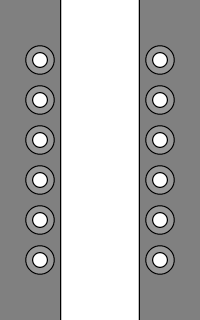 As shown in more detail in the main lacing diagram above, the second-from-bottom straight section runs straight across from left-to-right (on the inside), then right-to-left (on the outside), tucking under the vertical section on the left side. Contributed by Jeremy J. Start straight across the bottom with the ends emerging through both bottom eyelets, then run one end back across the bottom, under the side and out through the same eyelet as the other end. 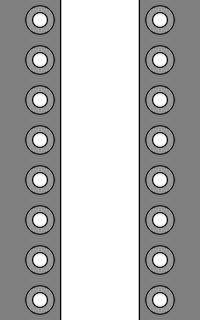 Both ends are now emerging from the same bottom eyelet (in this example, the bottom-right). Contributed by Dan S.
Use a single diagonal somewhere in the lacing, such as shown here at the very bottom. 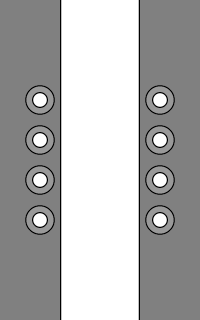 Near the middle, a diagonal may be positioned to line up with and run through a tongue centering loop (if the shoe has one). Instead of trying to hide a single diagonal, this alternative makes a feature out of a single crossover, similar to the look of Roman Lacing. 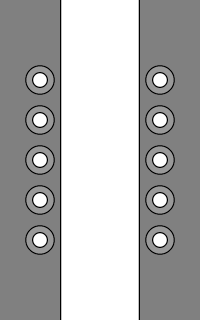 Unlike the above "One Diagonal" variation, the crossover cannot be placed in the middle of the lacing. Like a squashed version of the above "One Crossover" variation, both ends run straight across one pair of eyelets and feed a second time through the opposite eyelets. Being near the bottom, any difficulty with tightening or loosening this section is not so noticeable as the shoe doesn't need to open wide at that point. All of the above odd workarounds are laced normally through an even number of eyelet pairs, then something is added that may be either visually or functionally awkward. An alternative is to not add anything – instead leaving either the top or the bottom pair of eyelets empty, or even to skip one pair of eyelets somewhere in the middle of the lacing. Finally, if you're prepared to cut your shoelaces, the two portions can be anchored diagonally opposite each other at the bottom of the shoe, either with simple stopper knots or using Lace Anchors. Note that the two "half" shoelaces should be different lengths. Use the calculations for Half & Half Straight Bar Lacing in the Shoelace Length Calculator. For a neater (though slightly less comfortable) variation, the lacing can be done inside-out, with only the top two horizontal sections fed under the sides of the shoes to emerge through the top and 2nd from top eyelets (where the knots will be tied). This is effectively a side-knotted version of Straight Bar Lacing. The result is much neater, particularly when the sneakers have contrasting shoelaces, which would otherwise look messy with the vertical sections visible on the outside. However, it no longer has the benefit of even pressure distribution because the straight horizontal sections are now on the outside. This picture, sent to me by Stephen P., shows some shoes laced with inside-out Hiking / Biking Lacing, with the knots and loose ends positioned towards the outside for biking / cycling. "Please find enclosed photo of my favorite method. Extremely Comfortable – the eyelet tabs are held away from the foot, and the ladder lacing is next to the tongue giving even pressure. Taught to me by a friend who was in the British military – said they use it on especially long hikes to protect against blisters. If you'd like to send feedback about Hiking / Biking Lacing, please Contact Ian. Identical method done inside-out, which hides the knot on the inside. View and customize Hiking / Biking Lacing using Create-a-Lace. This page last updated: 17-Feb-2019. Copyright © 2005-2019 by Ian W. Fieggen. All rights reserved.